A blast of sunshine sounded like good medicine when, in the summer of 2004, I grappled with shakeups at the office while reeling from a bad breakup. The combination of work and love life under siege had me rattled. Things that helped me through before—more yoga practice, gym time, girls’ nights, long walks-and-talks with friends about how this is for the best—did little to soothe me. I couldn’t see how to get to the other side of my break up. Rock climbing had piqued my interest ever since I read, years before, that gymnasts make great rock climbers due to the strength-to-weight ratio common among the two sports. As a former gymnast, I thought I might be good at this. And wouldn’t it be a nice boost right now to discover a new strength—to test what my body could do? Being strong and small might come in quite handy with isometric holds and hoisting oneself up a rock. I heard Joshua Tree National Park—under three hours by car from where I live in Los Angeles—was one of the most celebrated locations for climbing. I booked a weekend excursion with the Joshua Tree Rock Climbing School and grabbed my friend Jen. We cranked up every classic breakup song in our music collections during the drive out, from Gloria Gaynor's anthem “I Will Survive” and Fleetwood Mac’s “Go Your Own Way” to Alanis Morissette’s “You Oughta Know.” Modest Mouse’s strangely soothing “Float On,” which came out on Valentine’s Day that year, was also on a loop. We met our instructor, Frazier, at the Hidden Valley Picnic Area, accessed via the west entrance to Joshua Tree National Park. Just as I hoped, little rushes of victory carried me through the first morning of instruction on practice boulders. I felt like a natural. We learned to look and feel for what Frazier called “holds,” or indentations and bumps on the boulders where we could place our feet and hands, hold our weight and push off to the next hold. I’d used my weight and all of my muscles at once as a gymnast—especially when tumbling—but never did anything like this. I was Spider-Woman. We learned the basics without the harnesses, before taking on the tall walls of tan and orange that extended into the vibrant blue desert sky deeper in the park—one of which made me think of the Cliffs of Insanity from the movie The Princess Bride. Upward view,"Cliffs of Insanity." Photo by Jennifer Ciminillo. It was August, and the desert heat was intense even at eight in the morning, only growing hotter throughout the day. I negotiated some tricky maneuvers, but as I held myself five feet high on one of the boulders, I noticed that my heart beat quickly. My hands became sweaty and swollen, and I slipped off. I’d panicked, not being able to see what was at the top or over the side, which was so similar to how I felt about both work and my break up. My view as I made my way up the boulder was blonde rock and dust. Would there be a plateau for me to rest at the top? Or would I have to prepare to immediately make my way down? Already overwhelmed—I saw no sign of the pain subsiding from the end of my relationship, and the unknowns at the office nagged at me—I began to fixate on more immediate concerns. Might I tire out completely before lunch? Given the extreme temperature, Jen, Frazier, and I had the park to ourselves. No one else was foolish to climb Joshua Tree in triple-digit heat. That scared me too. If one of us cooks to death, how easily will we find help? Soon afterward, we forged ahead. I watched the wiry instructor seemingly dance up 100 feet of a nearly vertical formation to fasten safety ropes. Again, my chest tightened. Not only did I hope he wouldn’t come tumbling down, I could not imagine getting way up there. The top looked so far away. Jen indeed attempted the climb and returned safely. She approached the adventure from a different mindset, and not just because she wasn’t going through a breakup at the time. While I’m a skeptic, a characteristic that has served me in journalism, Jen opens her eyes in the morning with a smile on her face, trusting the day is going to be a good one. Jen, then a design director and now a digital marketing VP, trusted the harness while I had twenty questions for it. Still, I harnessed in right after she returned. I reached two summits without relying on the harness, not even on the way down. As a result of my insistence on literally white-knuckling it, clinging to the rock as I headed back to the ground, my hands became scratched, achy, and streaked with blood. Midway up the third big climb of the day, I found myself unable to move. I still didn’t want to lean into the harness. Frazier said the rope could bear 10,000 pounds, but of course the whole way up I wondered, How do I know that is true? Because, really: How well do I know him--or how firmly he jammed the fasteners into the rock? I gripped the rock and scanned the area around me. Deep breath in, deep breath out. The surface looked totally smooth—no potential holds to be found. Sweat stung my eyes as I squinted at the orange vertical formations, or “climbs,” standing so solidly to my right and left, including one where nature appeared to have carved a grid of grooves and holds. Why aren’t I on that one right now? I told myself not to look down as I blinked my eyes closed. Jen and Frazier shouted encouragements. They also suggested that if I shifted myself, I would spot another move. “Shift! Shift!” I kept hearing. Put one foot in front of the other/And soon you'll be walkin ‘cross the flo-o-or. “You overwhelm yourself trying to do everything at once,” my Mom has often counseled me, especially in moments when I push myself until I shut down. “You can’t see anything when you’re trying to look at everything,” she might say. “One thing at a time. One step at a time.” Mom has slogans for everything, and whips them out as often as her bin of all-purpose flour. She has done this for as long as I can remember. I ignored them for most of my life, but I had just started noticing—she’s usually spot on. The author getting the hang of it. Photo by Jennifer Ciminillo. Another breath and I opened my eyes. I shifted weight to my right foot and looked to my left, where I spotted a shallow nook. If I stretched, I thought, I could skooch my left fingers to it. The wise instructor was right: Each time I made an adjustment, I noticed a handhold or foot placement I didn’t see before. And then another and another. I repeated this until the summit marks appeared in front of me. I experimented on the way down too, leaning lightly into the harness at first and feeling it hold me, relying less on my own climbing and more on the faith that the system in place—literally and figuratively--would keep me safe. I awoke the next day blistered and sore, but ready to start using what I learned. Things I picked up the day before became second nature. I even repelled down one rock. 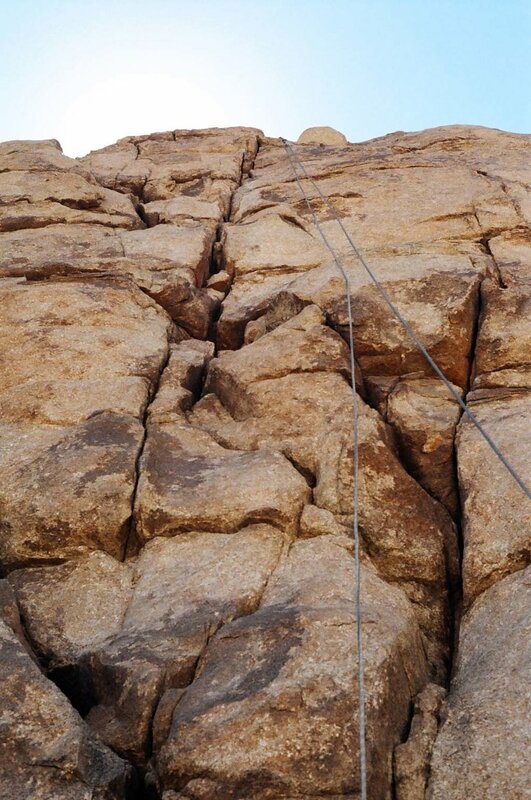 When I conquered the weekend’s last climb, I stood up at the top, holding myself with the ropes. I took my first real look around the expanse from that height. Afternoon shadows played on the hills that frame the surreal landscape, unlike any I’ve seen before or since. Rows and bunches of cactus-like trees featuring fuzzy brown trunks and bunches of thick, bright green spikes at the ends of twisted branches dotted the dry desert ground, which is peppered with gray brush. It resembled my childhood vision of Mars, which I am pretty sure was informed by my fascination with the TV show “Land of the Lost.” A brontosaurus would not look out of place here. I embraced my new perspective on the terrain. At Joshua Tree, I experienced pain and fear and still reached places I didn’t know existed. I just needed to keep looking at things from different angles and recognize that I was not alone. I had instruction and support from people who had been where I was headed, just like in my life back home. More than a decade later, the way that I tested my body, mind, and spirit at Joshua Tree has stayed with me. Taking the challenges one step at time helped me see I could take any aspect of life in stages. Now, whenever I need a reminder to take things as they come, I reconnect with that lesson on the rocks by visiting Runyon Canyon Park, a popular hiking location near my home. Known for celebrity sightings, dogs off their leashes and views that span the Pacific Ocean, downtown L.A. and the nearby Hollywood sign, its bustling appearance and well-worn trails are quite different from the otherworldly Joshua Tree. The new attitude I forged and the distinct desert landscape shape a singular memory that at times feels like it may have taken place on an entirely different planet. But I now can quickly tap into the step-at-a-time pace in any place or moment. And while I may not be as unshakeable as the formations I climb, I do know my ability to overcome obstacles, whether physical, mental or emotional, is solid. As a rock. Melissa Grego is a Los Angeles-based writer, editor and consultant. She is the former Editor-in-Chief of television industry publication Broadcasting & Cable; she also is the founder of the Keynotes & Cocktails: Women of the West and Women of NY conferences for women in business. In 2015 Grego parlayed her network and knowledge as a journalist to launch her consulting company Melinc (mel-link), with a mission to promote equality in media and entertainment. Follow her on Twitter (@melissagrego) and Instagram (@melissamgrego).